Candidates running for the State Board of Education include a Republican who once claimed President Obama used to be a prostitute and a Democrat who described herself as a “MeXicana Empowerment Specialist." Editor's note: This story has been updated to include more information about Joe Fierro, Jr.'s fundraising as well as to embed a screenshot of a Facebook post, since deleted, from Mary Lou Bruner. Save for some flare-ups in the past few years over what to put in social studies textbooks — and how to handle an error in one of them — the State Board of Education has seen more turbulent days. The 15-member board in charge of crafting curriculum and textbooks for the state’s more than five million public schoolchildren spent years building a national reputation as the center of raucous quarrels over how — and whether — to teach young Texans about evolution, Islam and climate change. Now, such charged exchanges are less common. Those who closely watch the board attribute the shift to the dispersion of a cadre of fervent right-wing conservatives, many of whom either retired or were voted out. But the relative camaraderie could soon come to an end as two more moderate members step aside — and not just among the board’s Republican membership, where nearly all the notorious infighting has occurred. Among the contenders in the races to replace Republican Thomas Ratliff of Mount Pleasant and Democrat Martha Dominguez of El Paso is a 68-year-old East Texas retiree who has said that President Obama used to be a gay prostitute and a 41-year-old self-described “MeXicana Empowerment Specialist” who says the board’s Democrats have sat silent for far too long. Both Republican Mary Lou Bruner, of Mineola, and Democrat Georgina Cecilia Perez, of El Paso, taught in public schools for years. That’s one of the few things they have in common, along with a clear passion for their respective causes. Observers and political scientists say both women have emerged as strong contenders in their separate races and could easily claim victory in the March 1 primary, an outcome that could mean the return of a more quarrelsome board. Bruner, who has won endorsements from influential movement conservatives like Cathie Adams and JoAnn Fleming, is one of three Republicans vying for the nomination to replace Ratliff in representing District 9, a 31-county swath that spans the northeast quadrant of the state. 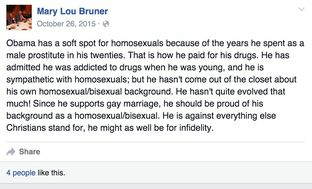 But it’s Bruner’s voluminous Facebook posts, not her endorsements, that have generated the most buzz in the race. A majority of them echo the kind of anti-Muslim, anti-gay or anti-science opinions commonly spouted by members at education board meetings of yore, but observers — and detractors — say she takes it to a whole other level. State Board of Education hopeful Mary Lou Bruner has won several high-profile endorsements but it's her Facebook posts that have generated the most buzz in the race. The East Texas native has since deleted this post about President Obama, but declined to explain why. 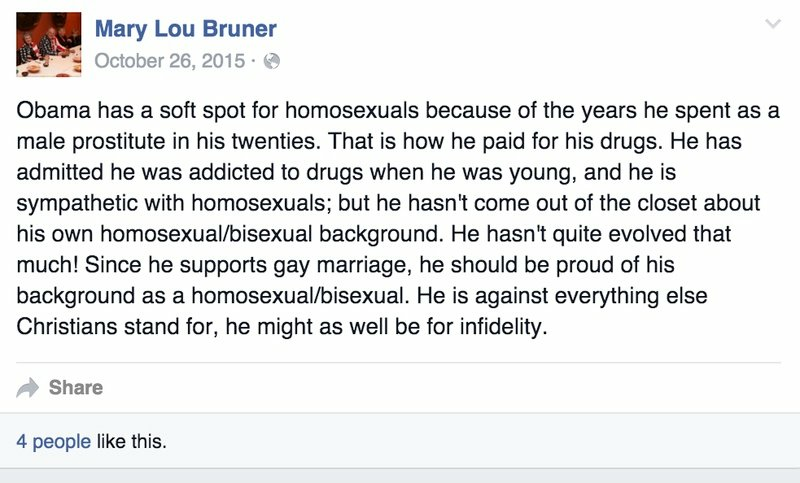 “Obama has a soft spot for homosexuals because of the years he spent as a male prostitute in his twenties,” Bruner said last October in a now-deleted post on the wall of her personal Facebook page, where she also has posted campaign materials and solicited votes. Bruner, who worked for 36 years in East Texas schools as a teacher, counselor and educational diagnostician, said she stands by all her posts but deletes the ones she comes to learn are inaccurate and also publicly apologizes. The Tribune could not, however, locate a public apology for that post on Obama, which Bruner has since deleted from her Facebook page. Asked specifically about the post and whether she still believes the president used to be a gay prostitute, Bruner said: "You are obviously a hostile and biased reporter pretending to be a friendly reporter to gain my confidence. The interview is over." Bruner stands in stark contrast to newly minted Lufkin school board president Keven Ellis, who experts say also is a strong contender in the District 9 race. The 44-year-old chiropractor has won endorsements from state Rep. Trent Ashby of Lufkin and outgoing House Public Education Chairman Jimmie Don Aycock of Killeen, both of whom are key members of the moderate block of Republicans in the Texas House aligned with Speaker Joe Straus. During his three years on the Lufkin school board, Ellis said he demonstrated his conservative chops by supporting a 100-percent locally-crafted curriculum that is free of influence from Common Core — a K-12 educational standards initiative many states have signed onto but which Texas’ GOP leaders have rejected for a perceived liberal bias and inferiority to local standards. "I am a strong conservative Republican," Ellis said, noting he brags about having support from school officials and that his opponents "don't seem to believe in public education the way that I do." "I believe with all my heart the administrators in our district and across the state — and even more the teachers — are wonderful people doing great work, and I want to support them and not fight against them," he added. If Bruner weren’t running, she says she would endorse the third candidate in the District 9 race, Hank Hering, a local Republican Party activist who said he was unavailable for an interview in an email that included “A Plenipotentiary of the King” in his signature, an apparent analogy for a messenger of Jesus Christ. Whoever prevails in the District 9 GOP primary race will face Democrat Amanda Rudolph, a secondary education professor at Sam Houston State University who is unopposed in her primary. If Bruner wins, “it’s almost certain we would see the board shift back to those divisive and dysfunctional battles over culture wars that were more common four or five years ago,” said Dan Quinn of the liberal Texas Freedom Network, which closely tracks the state board and has criticized Bruner. But Quinn also acknowledged the possibility of a similar problem in another SBOE race where Democrats are favored to win. The election of the outspoken Perez to District 1 could also create “some partisan problems on the board,” he said. Much like Bruner, Perez, a 41-year-old mother of four, also vows to bring “a very strong voice” to Austin. The former 8th grade language arts teacher contends the board’s five Democrats are “far too silent most of the time” — often sidelined as the board’s moderate and social conservatives dominate the debate. Perez, who retired from teaching a year ago and now is seeking a doctorate in education at the University of Texas at El Paso, targets the education panels’ far-right Republicans prominently on her website. “The SBOE is an important entity that has been hijacked by extremists that are more concerned with advancing an ultra-conservative agenda and rewriting textbooks than they have been overseeing the education of Texas youth,” reads a quote on the homepage. But Perez, who has won endorsements from fellow El Paso Democrats Sen. José Rodriguez and Rep. Mary González, also dismisses any concerns that she might not play well with others. She points to her work last year crafting a proclamation that the education board ended up approving in a 12-2 vote supporting the implementation of ethnic studies courses. Meanwhile, one of her challengers, Joe Fierro Jr. — a long-time Army soldier who is retiring to run for office — is painting himself as a consensus-builder, although he claims that it isn’t meant as a direct jab at Perez. In 2012, the El Paso native founded an organization that helps raise money to support extracurricular activities at his alma mater high school. If elected, he says he wants to bolster technology access at schools and reduce the emphasis on high-stakes standardized testing. Fierro says he has won endorsements from many local educators and received financial support from 17 Army generals. But the vast majority of the money Fierro has reported raising has come from the political action committee of the powerful Texans for Education Reform, which gave him $15,000 earlier this year in the form of in-kind political consulting and production. The third candidate in the race, Lynn Oliver, did not respond to an interview request. She is a retired public school teacher who now lectures in the Department of English at the University of Texas at San Antonio. 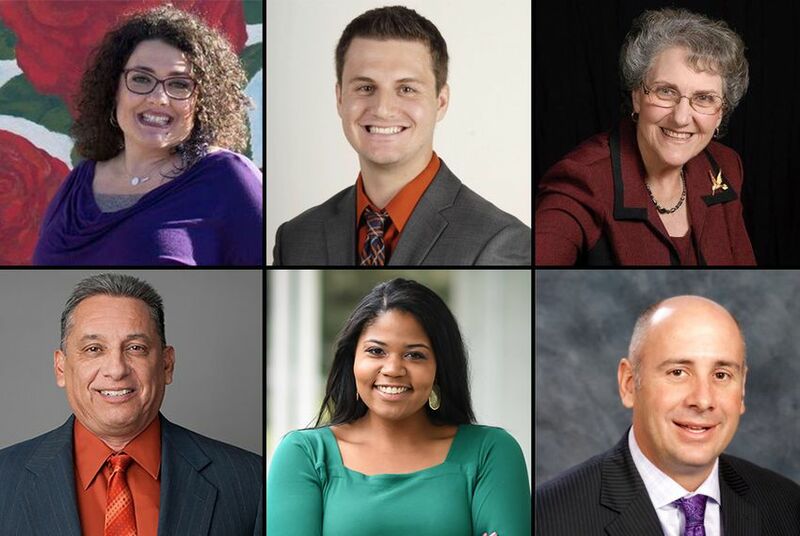 Most candidates in competitive education board primary races have raised less than $17,000, the latest reports show. Ellis raised the most during the most recent reporting period, $15,752, but spent about the same as fellow Republican Bruner, who expended most of the $2,848 she raised during the same period. Rice University political scientist Mark Jones says the low fundraising figures are indicative of most education board districts being safe for either Republican or Democratic candidates — after redistricting — and so not very competitive. That’s bad news for the three Democrats hoping to replace Republican board chairwoman Donna Bahorich in November to represent District 6, a rambling GOP stronghold that covers parts of Houston. Gov. Greg Abbott made waves last June when he appointed the socially conservative homeschooler — and former staffer to Lt. Gov. Dan Patrick — to lead the board. Bahorich has no primary opponent. Neither do five other board members up for re-election — Tom Maynard, Barbara Cargill, Marty Rowley, Sue Melton-Malone and Ken Mercer — although some will face Libertarian and Green Party challengers in November. Two of the Democrats seeking the District 6 nomination — Jasmine Jenkins and Dakota Carter — criticized Bahorich, as well as each other, for lack of experience and predicted their own passionate campaigning will push them to victory. The Panhandle native expects to receive his doctorate in education next year from the University of Houston, with a focus on curriculum instruction and leadership. Jenkins, 32, also has a doctorate in education but says her experience teaching bilingual 4th grade in the Houston area for two years may be more important to voters. “Being well educated doesn’t make someone an educator,” said Jenkins, who now is the manager of community-based initiatives at Advantage Testing of Houston. "I hope that people will really recognize that and put these decisions in the hands of experienced educators." The third candidate in the race, Michael Jordan, did not respond to an interview request. He has raised no money and appears to have no campaign website. Disclosure: Both Rice University and the University of Texas at El Paso have been corporate sponsors of The Texas Tribune. Texans for Education Reform was a corporate sponsor of the Tribune in 2013. A complete list of Tribune donors and sponsors can be viewed here.